It's early August and the weather hasn't been all that cooperative. This summer has been cooler with more rain than in past years. Yet, many flowers are happily blooming their heads off! Don't you just love Marigolds? They are always bright and cheerful and continue to flower well into early October. Found a few Japanese beetles on them, but just plucked them off and plopped them into a cup filled with some soapy water. Adios! Have some Lauren's Grape Poppies blooming ... the flowers are not as large as last year's, but I do so love the color! and white. If Geraniums came in blue, I would do a mix of red, white, and blue and be very patriotic. My Hollyhocks have been my biggest delight this summer. It's the first time they've bloomed and they're still going strong. I do see some seed pods forming. Hopefully, they will drop some seeds and self sow. I'm also going to try and salvage some seed pods as well. My Tall Garden Phlox are really pretty this summer. I bought 2 small plants on clearance from either HD or Lowes last summer and planted them. They did bloom, but this year they were much taller and really spread. They are just so pretty, and the scent, is heavenly! More Morning Glories ... with a pot of yellow zinnias for company. Side note: Have 2 similar trellises in front of the house that had Morning Glories covering them nicely until the deer got to them. Also had a nice Nelly Moser Clematis growing on one of the trellises. Deer got that too! Lastly, on the other side of the back deck, in the foreground, is a large pot of Catnip for a special buddy. On the right is a pot of tall climbing Nasturtiums. On the railing... a window box filled with red/white Geraniums and two pots of Marigolds. On the railing on the far right .... Red Million Bells Petunias in a very UGLY flowerpot decorated with a pair of Cardinals. Hi Janie, lots of flowers. 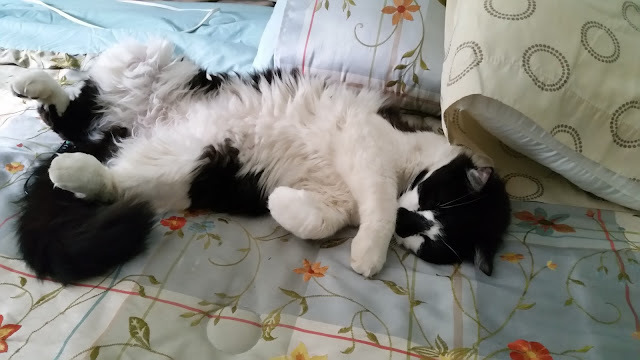 I'm not usually crazy about cats, but I must admit Patch looks so delightful I'd probably plant catnip for him too. I love the poppies and geraniums. Do you put the geraniums in salads? I think marigolds petals too can be put in salads, not certain of that though.